I have been playing guitar for 15+ years and your teaching about modes just opened up something that you just can't imagine! This question or scenario will help me (and others hopefully) kinda sum it up. This song is in B minor, right? For my question I will only look at the verse or chords used for the main solo, not the chorus. So, you can use any notes in B minor or D major (relative). When it comes to modes all the modes derived from D Ionian can be used (ie: F# phrygian, C# locrian, G lydian, etc). It is also possible to use Ionian or major scale for every single major chords or minor over minor chords. There is also arpeggios and pentatonic that I can think of. Thank you and what you teach is gold! Jump to 4:32 and we can hear what is considered among many to be one of the most powerful guitar solos in rock history, courtesy of David Gilmour. And it's all quite simple in theory - written predominantly using B minor pentatonic and its b5 variation (the minor blues scale). Yes there is, theoretically, a lot more you could do with these chords (the album version is in Bm - Bm / Amaj / Gmaj / Em / Bm). But to say there was anything missing from Gilmour's exclusively minor blues solo would be tantamount to musical blasphemy! Gilmour teaches us mere mortal guitarists an important lesson - that sometimes the "KISS" principle is the most effective. Especially in straight ahead minor key rock. But let's indulge ourselves anyway for the sake of musical exploration. So, as established, we're in B minor. How do we know this? By familiarizing ourselves with the most common natural minor chord progressions. So, B natural minor is our "parent scale" for this progression. It can be used over all the chords. And where there's natural minor, there's minor pentatonic and minor blues, as Gilmour clearly understood! A much more "exotic" sound to westernised ears. Use it sparingly. If we were to use harmonic minor, it would be best to change back to natural/pentatonic minor as soon as the progression moves off that B minor tonic, to avoid some unpleasant dissonance. Again, as a variation to B natural minor, try moving to the A root (2 frets down from our B scales) and playing A lydian dominant over Amaj. Why does this work? Because as Amaj is the VII chord and its natural 7th chord is a dominant 7th. 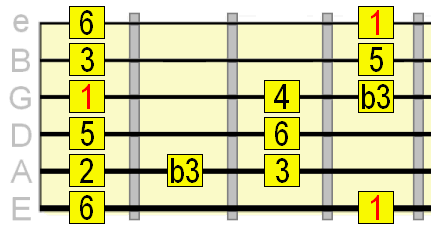 Whenever a dominant 7th chord is played or implied, lydian dominant is always a viable choice outside the diatonic (natural) scale. That augmented 4th interval (#4) is quite dissonant, so don't dwell on or emphasize it. We could also play major pentatonic on that A root, adding in the minor 3rd (b3) for a bluesy touch. But like with Amaj, we could also give this chord a dominant 7th flavour by moving to the G root and playing lydian dominant. As for Em, we're only on that chord for the blink of an eye so it's probably best just to get back on that B root and prepare for the return home with some kind of lead-in phrase. So, a number of scale options to try there, but sometimes it's good to think about scales and notes in the same way you would junk food - indulge too much and you risk "bloating" the music with superfluous calories! If there's one thing that can be said about Gilmour, it's that he was a master of minimalistic lead guitar and he showed that, sometimes, one scale will say everything that needs to be said. i / bVII / bVI / iv / i (bVI), right? Yes, you're right, well spotted! This has been changed. Thanks. A great lesson with practical advice how to use your recommended scales in licks - thanks a bunch! 2)You mentioned to play A Lyd. Dominant over A. Is there any reason why your choice wasn't A Mixolydian? Could you also give a lick as an example? 3)And now for a more general question: I noticed with rock guitar instructors that when playing lead they either have their left hand parallel to the fretboard (more like classical playing) and sometime slanted. Is there any rule as to which method you use? The "b" in front of the VI and VII simply means "flat". This gives us our most common major key progressions. This gives us our most common minor key progressions (such as that used in Comfortably Numb). The lower/upper case numerals tell us whether it's a minor/major chord and the "b" tells us where the root of that chord is positioned in relation to the tonic (I or i). I deliberately didn't suggest A Mixolydian, because that's essentially what you're playing if you play the B natural minor scale. 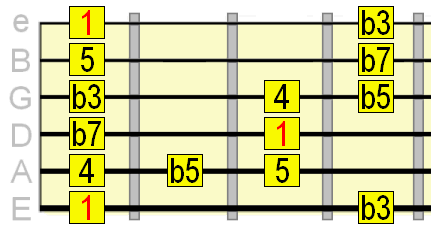 A Mixolydian is a relative mode of (i.e. uses the same notes as) B natural minor. If you play B natural minor over the entire progression, you'll essentially be playing A Mixolydian over Amaj and G Lydian over Gmaj and E Dorian over Em without changing patterns or positions! That's the convenience of playing natural minor in minor keys. It covers all the natural chord harmonies of that key in one single pattern. There are no rules as such, just do what feels most comfortable to you. I personally prefer the "non-classical" position, but that's just me.